In need of cooking inspiration? Look no further! Our inventive community creates fablous recipes, and we choose the best one each week to cook, photograph, and publish for the world to taste. If you’d like your own recipe to be featured, send it to community@kitchenstories.io. Is there anything better than freshly-baked homemade cookies? 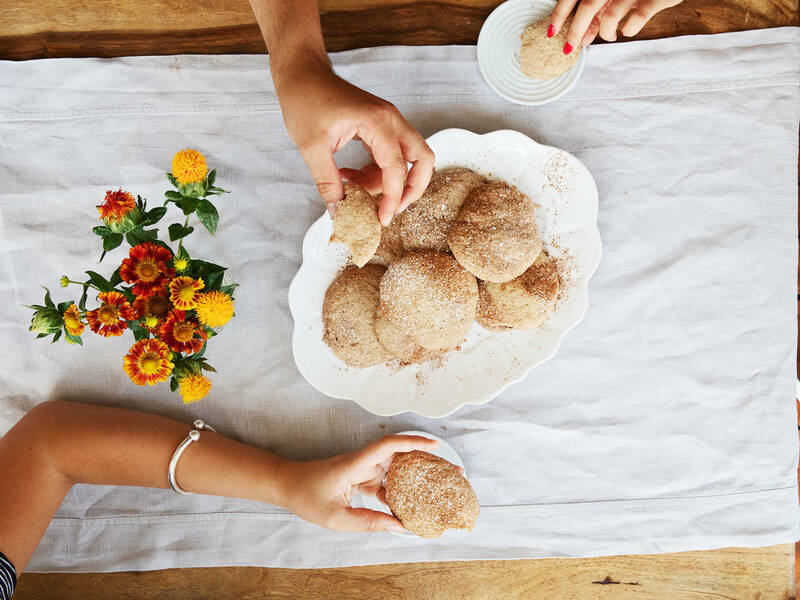 Rolled in sugar and cinnamon, a plate of snickerdoodle cookies are the perfect almost-fall treat. Our community member tnr.bpa shared her recipe for the beloved American classic – snickerdoodles. So whether you bake on the regular or are just warming up to it, we have you covered with the key steps to getting chewy, crackly cookies every time. What’s behind the quirky name? If you are from USA or Canada, you’re sure to be familiar with this cookie creation. If not, you might be hearing about them—and their intriguing name—for the first time. Though it’s called a cookie, you can expect a slightly cakey, soft center and crackly surface. So beloved are they that you'll find everything from snickerdoodle-flavored lattes and ice cream to their cinnamon-y scent captured in body lotion and candles. We all know they’re called classics for a reason, so it’s always a treat to receive time-trusted regional recipes from our community. In her recipe tnr.bpa amps up the base flavour by adding cinnamon chips to the mixture. If you can find them, certainly do try to get your hands on them. If not, they can be left out or replaced with chocolate chips. How to achieve the signature Snickerdoodle texture? Even though you might be wondering what in the world is cream of tartar is doing in your cookies, Snickerdoodles’ signature tang and pillow-like texture is all thanks to this obscure ingredient. Be welcoming to it! To get the right texture, the butter should be at room temperature, if it’s melted, you run the risk of making your cookies greasy rather than chewy. Before scooping out the dough, make sure it is completely chilled. Refrigerate it over night or place it in the fridge for at least an hour. It will save you the struggle of forming the sticky batter into balls. Refrigerating also means that the butter re-solidifies, preventing the batter from spreading and the cookies from becoming thin and crunchy. When it comes to baking cookies, a mere minute can make a big difference—so be prepared to act quickly. When you see the edges starting to crisp up the cookies begin to look golden. Even if you think the middle might still be slightly undone, take them out! This will prevent your cookies from drying out and help you achieve snickerdoodle’s signature chewiness. Do you have a favorite baking recipe you’d like to share? Send in your recipe to community@kitchenstories.com for your chance to be published.